Tansun have a versitile, commercial grade 2kW weatherproof (IP24) and low glare patio heater on offer. Traditionally priced around the £180.00 mark, so at its current price, it’s a steal! These Sorrento heaters come with a 2-year warranty and are perfect for commercial or residential installation. The 2kW version of the Sorrento offers up to 11sqm of heat – this is just above average for a wall mounted, low-glare infrared heater. There other heaters on the market which are somewhat cheaper and come with a larger heating area – Futura Deluxe 2.0kW as an example, costing nearly £50.00 less will heat up to 25sqm. Although we searched high and low, we were unable to find any life-span estimate on these elements. Traditionally quartz halogen elements will come with a 5,000-7,000 hour life-span and we would expect these to last about the same. Offbrand replacements can be found from £19.99 for a ruby lamp or £39.99 for a gold covered element. These heaters are adjustable, the caveat being you will need to purchase a separate remote and wireless receiver(s) to utilise the 50%/75%/100% settings. The 2kW wireless receivers can be found for ~£100 and the 6kW receiver for approximately £140. Remotes costing approximately £40-50. Remotes can control up to 6 zones in unison. Ideal for large commercial installations. Each patio heater is supplied with a 3-metre long power cord and 3-pin British standard plug. These heaters can also be linked together in a 2x or 3x formation, via wall bracket or ceiling chain. This commercial patio heater comes in Black or White. Built from high quality aluminium. Each heater is supplied with a wall mounting bracket. These are easy-fit brackets and allow up to 3 heaters to be attached at once. Solid rating 2 – Protection against fingers or other objects less than 80mm in length and 12mm in diameter. Liquid rating 4 – Protection from splashing water. 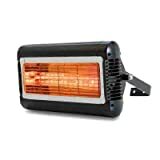 These are a high quality and smart looking patio heaters, suitable for any commercial installation in churches, factories, sports halls, garages, terraces, smoking shelters or even in zoos. The versitility of these heaters is fantastic. The modular feature makes heating large areas easy and the optional wireless receivers and remote makes this a scalable heating system. Great for airports, concert halls and so much more. They can also be installed in pub gardens, or restaurants and bistros etc. Our only real complaint with this heater is the additional outlay required for the remote and receivers. This can add a fair amount to your initial purchase price, but the functionality it offers is worth the investment. Prices range from £140-£220 for this model. If you can find it cheaper elsewhere, then you’re getting a great deal.